Our #GiveAFetch campaign aims to promote responsible pet ownership and community member while celebrating the special things we do for our dogs. 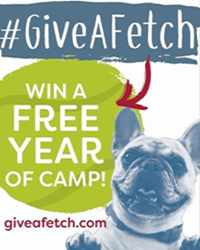 WESTMINSTER, Colo., Sept. 6, PRNewswire/ -- Camp Bow Wow®, the nation's largest Doggy Day Care and Boarding franchise and leader in the pet industry, is getting tails wagging across the country by announcing its brand new #GiveAFetch campaign. The $100+ million-dollar company, which ranked #1 in the pet category on the Entrepreneur Franchise 500 list for 2016 and 2017 and named in Entrepreneur's 2017 Best of the Best List in pet services, created the dynamic activation to promote being a responsible pet parent and community member while celebrating the special things we do for our dogs. Through a collaborative effort between the brand's corporate team and franchise network, the company plans to engage its clients, community donors and dog lovers across the nation to show why we all #GiveAFetch about our furry friends. The multi-faceted program will kick-off on Saturday, September 23rd and Sunday, September 24th with five interactive, dog-friendly events at parks throughout the U.S. in Atlanta, Cleveland, Dallas, Denver and Northern New Jersey. 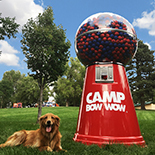 A unique experiential activation aimed at furthering Camp Bow Wow's commitment to corporate social responsibility, a 7 ft. tennis ball dispenser that holds over 2,000 balls will be placed in each park and for every ball dispensed, Camp Bow Wow will donate $5 (up to $50,000 for the campaign) to a local shelter of the user's choice. The dispenser also doubles as a photo booth and one lucky winner who receives the "golden tennis ball" will win a free year of Camp. In addition to the larger-than-life dispenser, local shelters/rescues will be on-site with adoptable dogs along with food trucks, activities including a caricature artist and a notable Instagram dog influencer who will be holding a meet and greet at each event. "While you used to hear people say, 'He or she is just a dog,' that mindset isn't the norm anymore. Bringing your dog to Day Camp is no longer considered a luxury as it delivers many benefits that are a necessary part of being a responsible pet parent – exercise, socialization, mental stimulation, relieving boredom and more. Our multi-tiered #GiveAFetch campaign truly encompasses the values and beliefs of the brand by promoting dog owners to enrich their pets' lives like any other family member," said Julie Turner, Camp Bow Wow's Vice President of Marketing. For consumers who are unable to physically attend one of the events, Camp Bow Wow has created an interactive social media campaign encouraging pet owners across the country to share a photo or video showing how they #GiveAFetch. Whether it's exhibiting how dog owners buy an abundance of extra toys or cook their pup a special meal, the winning submission will receive a free year of Camp. Entries will be counted from the kick-off weekend through October 31st. The upcoming #GiveAFetch program is a testament to the brand's position as a "leader of the pack" atop the doggy day care and boarding sector. The company is committed to serving as a responsible community member while pet parents are away or at work by providing dogs with a happy, safe place to play while simultaneously offering socialization, exercise, love, TLC and more from certified Camp Counselors. As the Camp Bow Wow team gears up to execute its creative and engaging campaign, the company proves its unceasing capacity to inspire pet lovers across the country. For more information about #GiveAFetch, details on the event in your area, Camp Bow Wow, or to become a franchise owner, please visit GiveAFetch.com, campbowwow.com or campbowwowfranchise.com.